This book is so much fun. From superheroes and villains battling it out, to a billionaire and college student falling for each other. Pat is such a fun character that you can’t help but love immediately. He’s constantly fumbling all over himself and rambling on when he’s nervous. The world Alex created is unique and so very interesting. There’s rules families of superheroes and villains have to follow. Plus a strict code of ethics and rules for battle that everyone follows, no matter how illogical it is to the average human. The one thing that became obvious in the story is that both sides truly want the same thing, in the most general of terms. They both want people to live better lives and not have to be forced to do things they perceive as wrong. The relationship that builds between Patrick and Nick is wonderful. All of the unintentional identity issues, miscommunications, and bending the truth ever so slightly leads for a fun ride of ups and downs for the two of them. There are a few places that things tended to drag a little when scenes got overly long or there wasn’t as much action. Overall the story is one that you don’t want to miss. My biggest problem is my own too-high-standards for a “happily ever after”. Most people would probably classify this one as an HEA. But for me there are still some things Pat and Nick need to work on to truly get to that point. I want to know how Nick handles dating the son of his nemesis long term. Alex: I don’t listen to music when I write – I find it too distracting. What’s odd about this is that it wasn’t always the case. I used to have background music on all the time! Sometimes I just listened to whatever music I liked at the moment, but sometimes there was a direct thematic connection between the music and the story. For example, I listened to Angelo Branduardi when working on a fantasy novel as a teenager. There’s a vaguely Renaissance sound to Branduardi that went well with the society, the court settings and formal dances. For a later m/m novel, I had “Breathe” by Midge Ure and a “Best of” CD by Midge Ure & Ultravox on near-constant repeat. I tried to keep listening to those songs when writing my next story, but that didn’t work at all. They were too deeply entwined with that particular story in my mind. Alex: I’m a part-time writer; I also work as a freelance copywriter and translator (English <> German). Molly: If part time, do you hope to one day be a full time writer? Alex: DO I EVER. Ahem. Yes. Yes, I do. 😉 It may not be a very realistic dream, but I’ve decided I’m too old to be so horribly pragmatic and realistic anymore. Alex: When I have entire days to write, I tell myself to write at least 1000 words, while aiming at 2000 to 3000 as the real goal. The most I’ve ever managed in a single day was something like 8k. Alex: That varies! There have been spells where I’ve launched into the next story immediately, before I’d even finished editing the previous manuscript. There have also been times when I’ve feared I’d never be able to write again because my mind seemed completely emptied of stories. Fortunately that’s always turned out to be an unfounded fear. It all began when I learned to decipher the alphabet. I soon found that the world was full of wonderful stories – but not all of the tales I wanted to read were being told. In self-defence, I began to write, and haven’t stopped since. 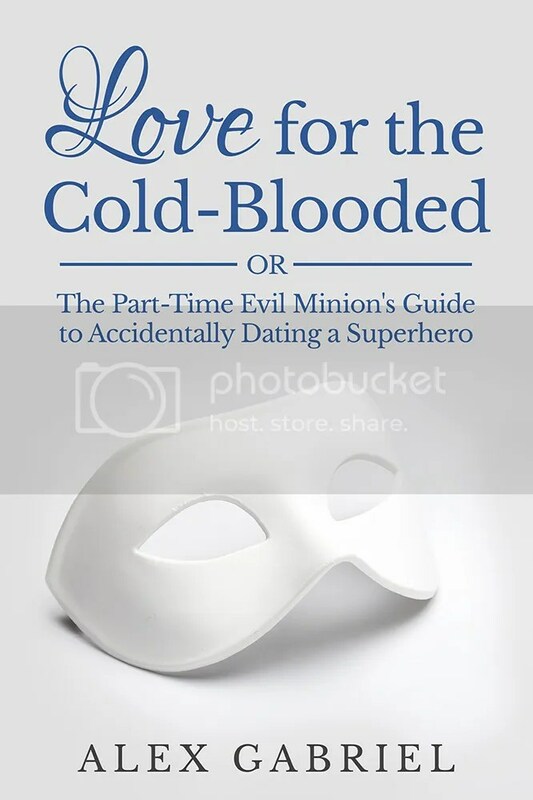 This entry was posted in Interview, Reviews and tagged Action, Author: Alex Gabriel, Comedy, Gay, HFN, Humor, Location: Author Created World, M/M, Rating: 4.5 stars, Superhero, Urban Fantasy, Villain. Bookmark the permalink.